Welcome to THE party of the summer! 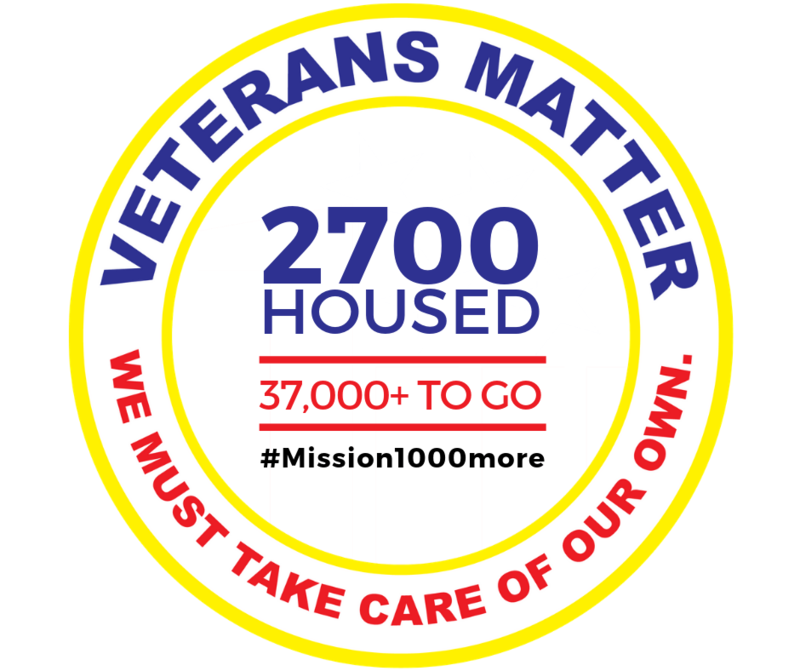 You have now housed 252 homeless Veterans through your participation in this annual event. You are a heroe to the heroes! 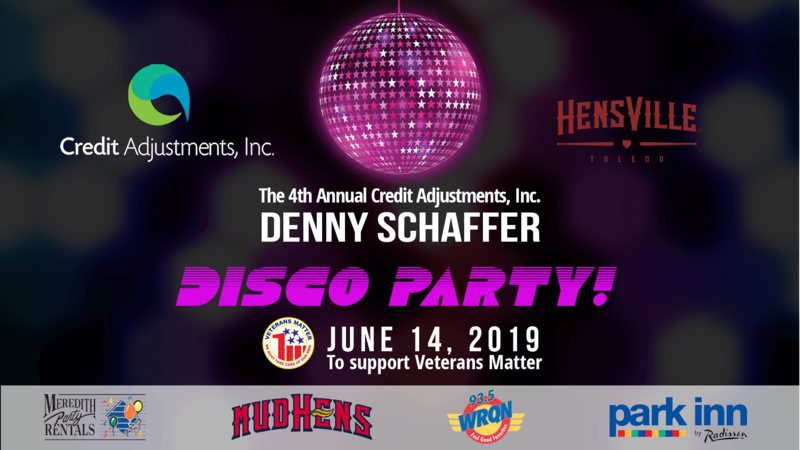 Credit Adjustment Inc.’s 4th Annual Denny Schaffer Summer Disco Party to benefit Veterans Matter takes place at Hensville Park on Friday, June 14 from 8:00 p.m. to Midnight. First, thank you for helping us House more Heroes! We started as a small hometown effort just to house 35 local veterans. At the urging of, and with funds raised by Dusty Hill of ZZ Top, John Mellencamp and Mitch Albom, it has grown. We have now housed over 2,700 vets nationwide. As we said, 252 vets have been housed just from Denny’s Disco Parties. So if you have attended one, you are a Hero to these Heroes. And if you bought a Heroes Table, 40 of those vets have been housed just by you! If you are new and will attend for the first time, we thank you. This annual event has sold out the first three years, so get your tables fast! As always, this is a rain or shine event. All of us wish to thank these Heroes who purchased Heroes Tables already this year to help more veterans get housed! Want 4 Free General Admission Tickets? Add your pix from previous years here on the Facebook Event Page and tag you and your friends. On June 1st we will select one of you to give 4 free General Admission tickets. Best Available – Gold Table – $35* p/p – Sold as a table of ten. Includes a bottle of complimentary champagne at each table and early entry at 7 p.m.
Upgrade your Gold Table to a Heroes Table for $150 and be recognized for helping house more veterans! See “Be a Hero” ——>. *plus a $2 transaction fee per ticket which helps us cover the printing, mailing, processing and credit card costs so more veterans can get housed. Best Available – Silver Table – $30* p/p – Sold as a table of ten. Silver Tables have early entry at 7:30. General Admission: $25 p/p* Sold individually. General Admission tickets allow entry at 8:00 pm and do not include a table. No worries on timing, Denny hits the stage at 8:15. In our survey some requested a less crowded area to sit and mingle, that wasn’t in front of the speakers. To see if there is a demand for this we created the Backstage VIP Courtyard. Behind the stage, away from the crowd, it will be lit and festooned as a courtyard for royalty. There are only 40 individual tickets available. To purchase a full table order ten tickets. Besides privacy, it will come with a bottle of champagne, of course, and the first two rounds on us. 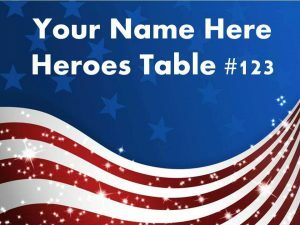 Upgrade any table to a Heroes Table and help more veterans get housed. 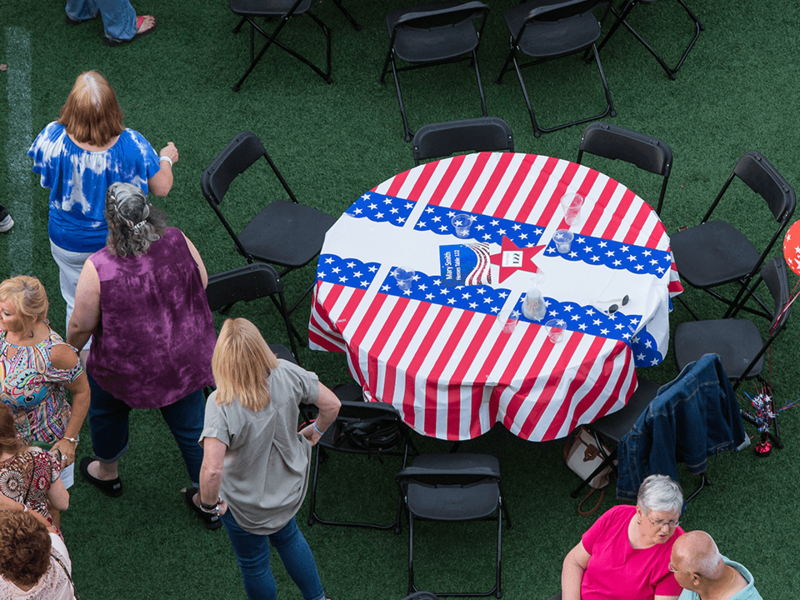 People will recognize you as a hero to the heroes because each Heroe’s Table includes a patriotic theme of patriotic red, white, and blue tablecloth, table tops and favors. Also, some caring veterans want to give you a complimentary bottle of champagne to thank you for helping their brothers and sisters by getting them off the streets and into homes of their own; they even want to come by your table to personally thank you! For Gold Heroes Tables, you will receive a second bottle of champagne to enjoy. Last year we moved 750 veterans from the streets and shelters into homes of their own. Every one of these are veterans who had nowhere else to go for the lease up costs. Please consider being a hero to the heroes living on the streets of our nation and help give them a home for the brave, in the land of the free. They are counting on us! Once again the Park Inn by Radisson has set aside a block of rooms at the discounted rate of $84 plus tax for our disco party people. You can use this link with the promo code “Disco” or use the same word if you call to make your reservation. The number is 419 241-3000. Don’t drink and drive, stay downtown, and take the elevator home. If you have questions post them to the Original Denny Schaffer Disco Party event page here as we are sure others will have the same questions. Or you can always email us for more info. Thank you Denny Schaffer for bringing the community together to make it possible for so many veterans to get housed. Your parties have now housed 252 veterans. On behalf of those dancers, partiers and veterans, we thank you. Credit Adjustments, Inc. (CAI) is a national company headquartered in Defiance, Ohio, bringing 300+ well paying jobs to Toledo with the focus of providing opportunity for all. An incredibly compassionate company, they are one of the lead funders of the Veterans Matter Walk, the Cherry Street Mission Life Revitalization Center Call Center Certificate training program; the ProMedica Ebeid Institute to provide training and employment to members of the community. And personally, they are truly incredible people who have become incredible friends. In all they anticipate hiring 300 people over the next three years. For information about a career with CAI, click here. 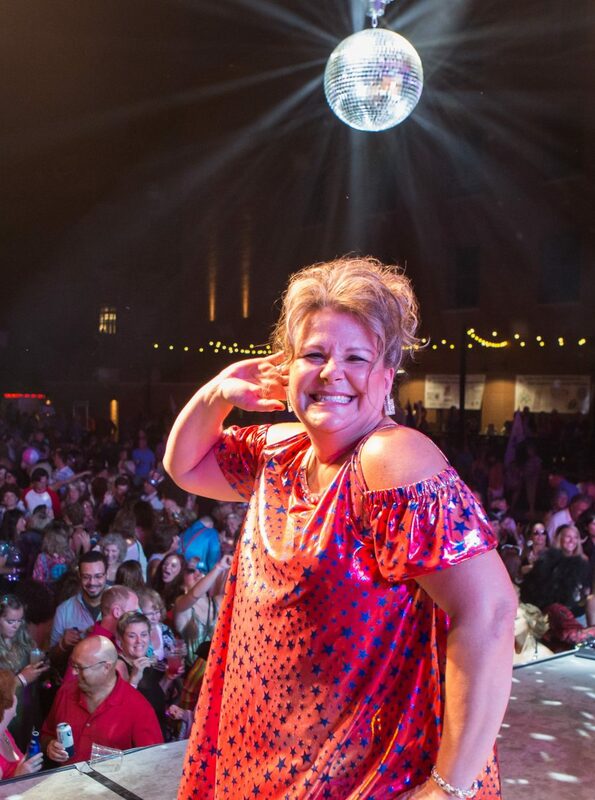 The CAI Denny Schaffer Summer Disco Party is a fundraiser for Veterans Matter. Our mission is simple, house as many veterans as we can, as fast as we can. Started here in Toledo to house 35 local homeless veterans, with the help of such music industry friends such as Dusty Hill of ZZ Top, John Mellencamp and Mitch Albom, the founder, Ken Leslie, expanded the program nationwide. Our goal for 2019 is #Mission1000more. The proceeds from this event will help Veterans Matter further this mission. You will be joining this once-in-a-lifetime opportunity to help create a national movement which started right here in Toledo! If you would like to join this mission as a friend, ally or advocate, you can join the mission by signing up right here. Veterans Matter is a program of 1Matters.org, the Toledo based non-profit sparked and supported by John Mellencamp which since 2007 creates programs to move the unhoused to financial and domestic autonomy. Locally, 1Matters is known for the annual Tent City, which takes place October 18 – 20, 2019.